More than 80% of officers and staff in Scotland do not support the integration of BTP Scotland into Police Scotland. That is one of the early findings of the BTP Leaving Home research project by Dr Kath Murray and Dr Colin Atkinson. The study considers the impact of the merger on the police officers, staff and special constables working on D-Division. The results show most officers and staff feel proud to work for BTP but nearly two thirds of respondents had given serious thought to leaving the force because of integration. Chairman of BTP Federation, Nigel Goodband, said: "The responses show the pride our officers take in protecting and serving the travelling public across Scotland. They are knowledgeable, passionate and experienced railway policing specialists, who are proud of and value their role within British Transport Police. This is the force they joined and the force they wish to remain with." "The impact of the integration is clear to see. Officers are concerned and frustrated at what remains an uncertain future. Despite this, officers remain committed to delivering an excellent service to the public and keeping the rail network in Scotland safe." In a post on social media, Dr Kath Murray commented: "The findings are important because any safe and effective integration will require buy-in and support from experienced and skilled staff - which is still to be secured. This is arguably a greater challenge than the sizeable practical obstacles still to be resolved." 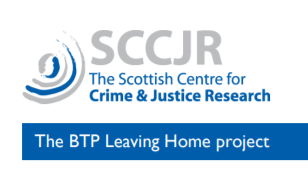 You can read the Leaving Home project briefing paper here.